I have been in private practice in Sarasota since moving here in 2000. I am fortunate to be in a partnership with 5 other urologists. Within our group, Urology Treatment Center, a division of 21st Century Oncology, we are able to offer care for almost all aspects of adult urology. My personal interest is in the treatment of male infertility and sexual dysfunction, as well as minimally invasive treatment for benign urologic disease. I have performed hundreds of vasectomy and vasectomy reversal procedures. I am originally from the Philadelphia area, having attended the prestigious Jefferson Medical College for my medical school training. I graduated in the top 10% of my class, and continue to be a member of Alpha Omega Alpha Medical Honor Society. From there, I moved to Miami, and completed General Surgical and Urologic training at The University of Miami/ Jackson Memorial Hospital program. In addition to general urologic training, I was involved with research at the Miami Project to Cure Paralysis. I was honored to present my work at the annual meetings of the American Urologic Association and the American Society for Reproductive Medicine. I have also received advanced training in microsurgery and vasectomy reversal through the AUA. I have two offices for my patients' convenience. Our main office is in Sarasota and the other is at the corner of University Parkway and Honore, near Lakewood Ranch. I have hospital privileges at Sarasota Memorial Hospital, Lakewood Ranch Medical Center, and Doctors Hospital of Sarasota. I have served as the Chairman of the Department Surgery at Sarasota Memorial Hospital. 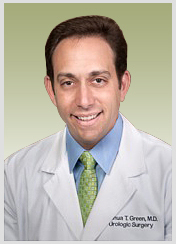 I am a Board-Certified member of the American Urologic Association and a Fellow of the American College of Surgeons. In addition, I am a member of the American Society for Reproductive Medicine and the Society for Male Reproduction and Urology. As I mentioned above, I have a special interest in minimally invasive urologic procedures. Below is a list of some of the procedures that I offer.